As the 7th most common cancer in men worldwide , bladder cancer originates from the urothelial epithelium of bladder mucosa with approximately 70% of bladder tumors classified as nonmuscle invasive tumors . However, there are still about 25% of newly diagnosed bladder cancer patients have muscle invasive disease . Further, it has been reported that more than 50% bladder cancer patients with muscle-invasive disease already have distant metastases . Even transurethral resection of the tumor is efficiency, these patients are at high risk of recurrence and occasional stage progression. Although radical cystectomy and systemic chemotherapy have been widely used as aggressive treatment options, the prognosis and therapeutic effects for bladder cancer patients with metastases remain largely unimproved . Illustration of key molecules or factors responsible for the metastasis of bladder cancer will be great helpful for drug development and clinical therapy. In many cancer types, the epithelial-to-mesenchymal transition (EMT) has been linked to the metastasis of cancer cells . It has been characterized as that cancer epithelial cells lose their polarity and are converted to a mesenchymal phenotype . At molecular levels, the expression of epithelial markers such as E-cadherin (E-Cad) decrease while the expressions of mesenchymal components such as vimentin (Vim) and fibronectin (FN) increase , which will result in weakened adhesion ability and enhanced motility . The EMT transcription factors (EMT-TFs) such as Snail, ZEB1, Twist and Slug play essential roles in regulating EMT . Snail can bind to the E-box site in the promoter of E-cad and trigger the EMT of many types of cancer . A growing body of evidence suggests that the EMT play a pivotal role in the initiation and development of metastasis during tumor invasion and progression of bladder cancer in vivo and in vitro . For example, fibroblast growth factor receptors (FGFR) can trigger the EMT of bladder cancer cells to increase the in vivo metastasis . The expression of ganglioside GD2 can reprogram the lipid metabolism and EMT phenotype in bladder cancer . These studies indicated that targeted inhibition of factors triggering EMT might be helpful for bladder cancer treatment by controlling metastasis. Transforming Growth Factor β (TGF-β) superfamily can promote tumor progression via regulation of multiple biological processes including EMT . Although TGF-β can trigger the progression of bladder cancer cells , the roles and related mechanisms of several members of TGF-β superfamily such as Nodal have so far been overlooked in the development of bladder cancer. Previous studies have shown that Nodal plays a critical role not only in embryogenic development but also in metastatic progression of several cancer types. For example, Nodal can induce a metastatic phenotype in pancreatic cancer cells via the Smad2/3 pathway. 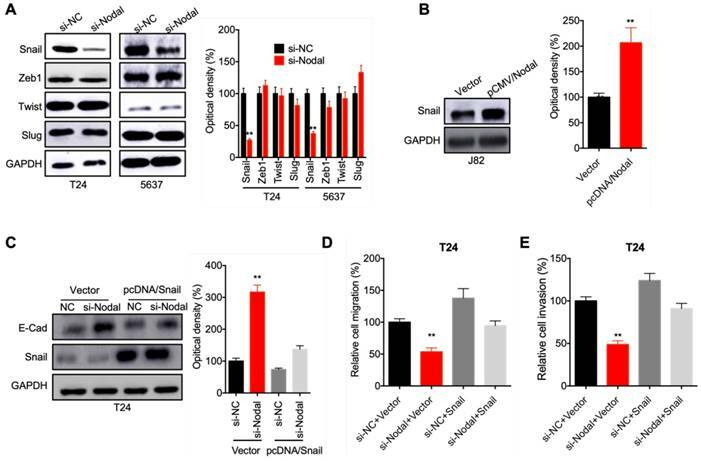 In breast cancer cells, Nodal can promote a tumorigenic phenotype via activation of ERK . The roles of Nodal in the progression of bladder cancer are still unknown. Our present study found that Nodal can trigger the in vitro migration and invasion of bladder cells via induction of EMT and increasing the expression of Snail. 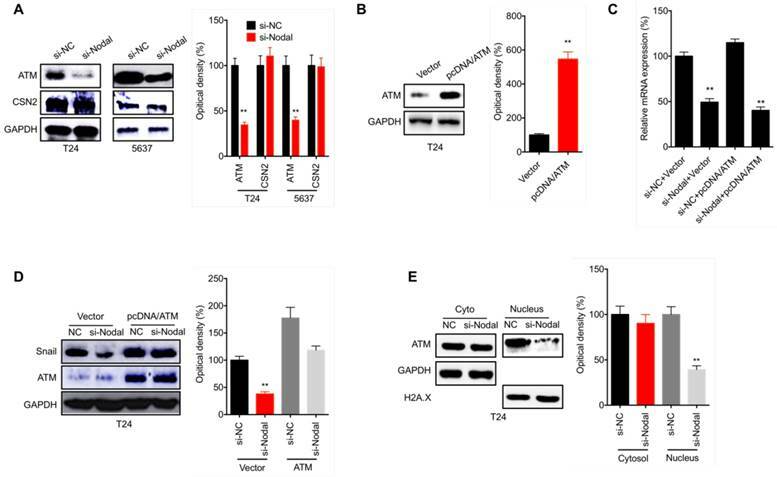 Mechanistically, Nodal can increase the transcription of Snail via Yin Yang-1 (YY1) and upregulate the protein stability of Snail via ataxia telangiectasia-mutated (ATM). The human bladder cancer cell T24, 5637, J82, BIU87, and SW780 and human urothelial cell line (SV-HUC-1) were obtained from the Institute of Cell Research of the Chinese Academy of Sciences (Shanghai, China). T24, 5637, and BIU87 were cultured in RPMI1640 medium, J82 in MEM medium, SW780 in L-15 medium, and SV-HUC-1 in F-12K Medium, respectively. All medium contains 10% fetal bovine serum (Gibco, USA) and penicillin/streptomycin (100 U/ml and 100 μg/ml respectively, HyClone). For transfection, cells were cultured in medium without antibiotics at least 24 h prior to transfection. Then siRNA of negative control (si-NC) or target genes, vector control or gene constructs were transiently transfected by use of Lipofectamine 2000 (Invitrogen, CA) according to the manufacturer's instructions. RNA was extracted by use of Trizol reagent (Invitrogen). The potential DNA contamination was removed by use of DNase I treatment. The cDNA was synthesized using oligo (dT) and Superscript II reverse transcriptase (Thermo). Real-Time PCR was conducted by use of SYBR Green MasterMix from ABI with ABI 7500 system (Applied Biosystems, USA) with the following program: 94°C 30 sec for denaturation, 52 °C 45 sec for annealing, and 72°C 45 sec for elongation. The primers were: Nodal forward, 5′- CTGCTTAGAGCGGTTTCAGATG -3′ and reverse, 5′- CGAGAGGTTGGAGTAGAGCATAA-3′; Snail forward, 5′- TCGGAAGCCTAACTACAGCGA -3′ and reverse, 5′- AGATGAGCATTGGCAGCGAG-3′; GAPDH forward, 5′-GGAGCGAGATCCCTCCAAAAT-3′ and reverse, 5′- GGCTGTTGTCATACTTCTCATGG -3′. GAPDH was used as the loading control for normalization. The expression of Nodal in culture medium of bladder cancer and SV-HUC-1 cells was measured by the Human NODAL ELISA Kit (Cusabio, Wuhan, China) according to the manufacturer's instructions. Primary antibodies for Nodal, fibronectin, E-Caderin, vimentin, Snail, Slug, Zeb1, Twist, YY-1, HIF-1α, Gli1, and GAPDH were purchased from from Abcam (Abcam, Cambridge, UK). Primary antibody for ATM and CSN2 were purchased from Santa Cruz Biotechnology (Santa Cruz, CA). HRP-conjugated secondary antibodies were purchased from Bio-rad Laboratories Inc. (Hercules, CA). Cells or tissue samples were re-suspended in ice-cold cell lysis buffer (Cell Signalling Technology) for 20 min to get the protein in supernatant. Each lane in 4-20% Tris-Glycine Gel (Invitrogen) was loaded with 20 μg of protein. After separation, proteins were transferred to PVDF membrane (Millipore, Bedford, MA, USA), blocked with 10% skim milk in Tris-buffered saline with 0.05% Tween-20 for 1 h at room temperature, and incubated with each primary antibody against its specific protein overnight at 4 °C. After washed three times according to standard procedures, membranes were incubated with a 1: 5,000 dilution of the secondary antibodies for 1 h. The bands were detected with ECL chemiluminescence. GAPDH was used as the loading control. Densitometric analysis was performed by use of ImageJ software. Five human bladder cancer samples and matched adjacent normal tissues were collected during surgical resection from October 2015 to July 2017. All samples were obtained with written informed consent signed by the donors voluntarily for research with no financial payment. The experiment protocol was approved by the Ethics Committee of the First Affiliated Hospital of Fujian Medical University. Cells were grown in 24-well plates until confluent and then cultured in 1% serum medium for wound healing scratch assay. An artificial scratch wound was created by use of a 200 µl pipette tip. The cell debris was removed by washing with PBS. At the indicated time period, the wound healing areas were photographed and quantitatively analyzed by ImageJ software. Each assay was carried out in triplicate and repeated in three independent experiments. The in vitro invasion assay was evaluated by use of Matrigel (BD, San Jose, CA, USA) coated 24-well transwell system (Costar, Lowell, MA, USA) according to the previous study . Briefly, 1 × 104 transfected cells were placed in the upper chamber and cultured in medium containing 0.5% FBS. Medium containing 10% FBS was used as chemoattractant in the lower chamber. At the end of the experiment, invaded cells in the lower surface of the membrane were fixed, stained and counted in 6 fields under a microscope for statistical analysis. After transfected with si-NC or si-Nodal for 12 h, T24 cells were further treated with cycloeximide (CHX) 100 μg/mL at the different time point. Western blot analysis of total proteins (30 μg) was carried out to measure the expression of Snail. Equal loading was verified by GADPH. The cytoplasm and nucleus of cells were separated by use of a nuclear/cytosol fractionation kit (BioVision) according to the manufacturer's instructions. Then RNA was extracted by use of Trizol (Invitrogen). The mRNA expression of Snail in cytoplasm and nucleus of cells was checked by qRT-PCR and normalized to GAPDH and U6, respectively. Effects of Nodal on the promoter activity of Snail was evaluated by luciferase assay according to previously described protocol . In cells transfected with si-NC or si-Nodal, cells were further transfected with pGL3-Snail-Luc and pRL-TK for the indicated time periods. At the end of experiments, cells were analyzed with Dual-Glo Luciferase Assay system (Promega). Renilla Luciferase (R-luc) was used to normalize firefly luciferase (F-luc) activity to evaluate reporter translation efficiency. Data are presented as mean ± standard deviation and analyzed using SPSS (version 19.0; SPSS, Chicago, IL, USA). Statistical comparison was performed using the Student's t test. In all cases, P < 0.05 was considered to be statistically significant. To evaluate the effects of Nodal on the progression of bladder cancer, we firstly measured its expression in cancer cells and tissues. As shown in Figure 1 A, qRT-PCR results suggested that the expression of Nodal in all measured bladder cancer T24, 5637, J82, BIU87 and SW780 cells were greater than that in human urothelial SV-HUC-1 cells. This was confirmed by the results of Western blot analysis by use of cell lysis (Figure 1 B) and ELISA by use of culture medium (Figure 1 C). We further evaluated the expression of Nodal in 5 paired bladder cancer tissues and adjacent normal tissues. Western blot analysis showed that the expression of Nodal in all detected bladder cancer tissues was greater than that in the adjacent normal tissues (Figure 1 D). Collectively, our data showed that the expression of Nodal is upregulated in bladder cancer cells and tissues. To evaluate the potential effects of Nodal on cell motility, we knocked down the expression of Nodal in T24 and 5637 cells via its specific siRNA (Figure 2 A). Would healing assay showed that knockdown of Nodal can suppress the in vitro migration of T24 cells (Figure 2 B). Further, knockdown of Nodal can also inhibit the in vitro invasion of both T24 and 5637 cells (Figure 2 C). 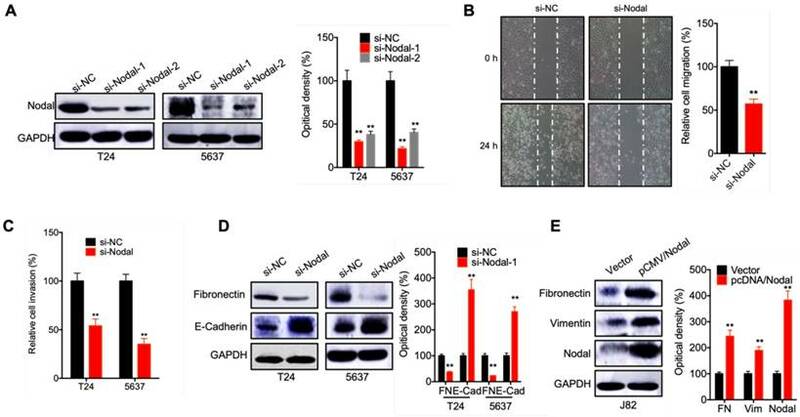 Western blot analysis showed that si-Nodal can suppress the expression of fibronectin while increase the expression of E-Cadherin in T24 and 5637 cells (Figure 2 D). However, the overexpression of Nodal in J82 cells can trigger the expression of fibronectin and vimentin (Figure 2 E). These data suggested that Nodal regulates the migration, invasion and EMT of bladder cancer cells. The expression of Nodal is upregulated in bladder cancer cells and tissues. The mRNA (A) and protein (B) of Nodal in bladder cancer cells and human urothelial SV-HUC-1 cell were checked by qRT-PCR and western blot analysis, respectively; (C) The levels of Nodal in cell culture medium were measured by ELISA; (D) The expression of Nodal in 5 paired bladder cancer tissues (C) and adjacent normal tissues (N) were checked by western blot analysis. Data are presented as means ± SD of three independent experiments. * p<0.05, ** p<0.01 compared with control. Nodal regulates the migration, invasion and EMT of bladder cancer cells. (A) T24 and 5637 cells were transfected with si-NC or si-Nodal-1/-2 for 24 h, the expression of Nodal was measured by western blot analysis (si-Nodal-1 was used for next studies); (B) T24 cells were transfected with si-NC or si-Nodal for 24 h, the wound closure of cells was recorded (left) and quantitatively analyzed (right); (C) T24 or 5637 cells were transfected with si-NC or si-Nodal for 24 h, the in vitro invasion of cells was quantitatively analyzed; (D) T24 or 5637 cells were transfected with si-NC or si-Nodal for 24 h, the expression of EMT markers was checked by western blot analysis; (E) J82 cells were transfected with vector control or pCMV/Nodal for 24 h, the expression of EMT markers was checked by western blot analysis. Data are presented as means ± SD of three independent experiments. ** p<0.01 compared with control. To investigate the potential mechanisms involved in Nodal regulated EMT of bladder cells, we checked the expression of EMT-TFs in cells transfected with si-Nodal. 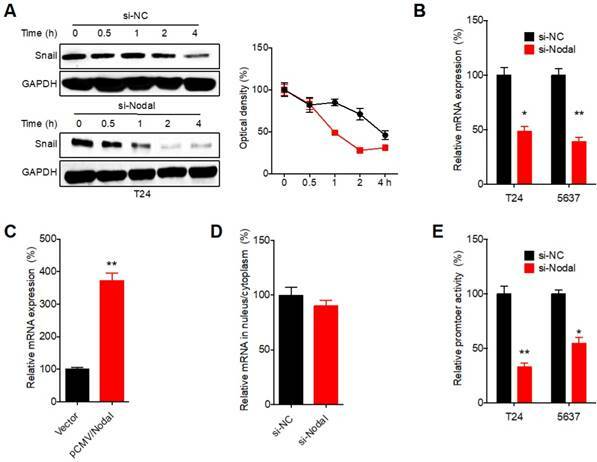 The results indicated that si-Nodal can suppress the expression of Snail, while had no effect on Zeb1, Twist, or Slug, in both T24 and 5637 cells (Figure 3 A). Consistently, overexpression of Nodal can increase the expression of Snail in J82 cells (Figure 3 B). We further over expressed Snail in T24 cells. Overexpression of Snail can attenuate si-Nodal induced upregulation of E-Cadherin in T24 cells (Figure 3 C). Further, overexpression of Snail also reversed si-Nodal inhibited migration (Figure 3 D) and invasion (Figure 3 E) of T24 cells. These results indicated that Snail mediates Nodal induced EMT of bladder cancer cells. We then investigated the molecular mechanisms responsible for Nodal induced expression of Snail. Firstly, we blocked the protein translation in T24 cells via treated cells with cyclohexane (CHX). Western blot analysis showed that si-Nodal can significantly decrease the half-life of Snail in T24 cells (Figure 4A). Further, si-Nodal can decrease the mRNA expression of Snail in both T24 and 5637 cells (Figure 4 B). While over expression of Nodal can increase the mRNA of Snail in J82 cells (Figure 4 C). However, si-Nodal had no effect on the mRNA distribution of Snail in cellular fractions such as cytoplasm and nucleus in T24 cells (Figure 4 D). Promoter luciferase assay showed that si-Nodal can significantly decrease the promoter activity of Snail in both T24 and 5637 cells (Figure 4 E). These results indicated that Nodal can regulate the transcription and protein stability of Snail in bladder cells. Previous studies indicated that YY1, HIF-1α , and Gli1 can regulate the transcription of Snail. In T24 cells, si-Nodal can decrease the expression of YY1, while had no influence on the expression of HIF-1α or Gli1 (Figure 5 A). Consistently, si-Nodal also decreased the expression of YY1 in 5637 cells (Figure 5 B). However, in T24 cells transfected with pcDNA/YY1 (Figure 5 C), the si-Nodal suppressed transcription (Figure 5 D) and protein expression (Figure 5 E) of Snail was markedly attenuated. Further, si-Nodal can decrease the mRNA expession of YY1 in both T24 and 5637 cells (Figure 5 F). Our results suggested that YY1 is involved in Nodal induced transcription of Snail in bladder cancer cells. Snail mediates Nodal induced EMT of bladder cancer cells. 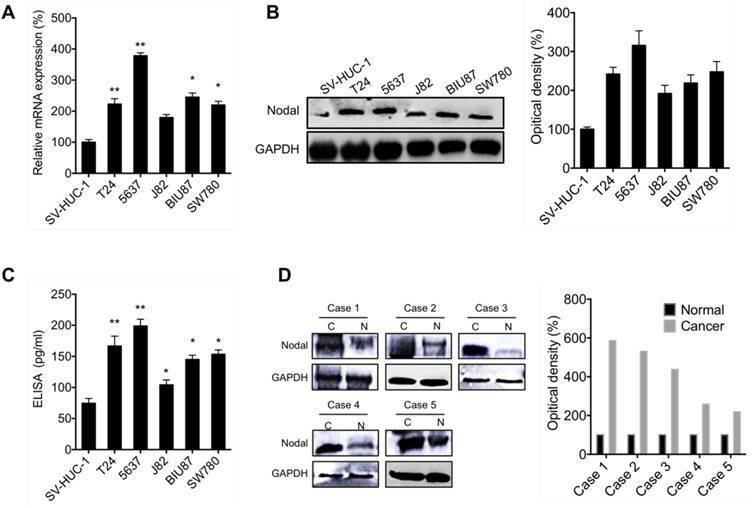 (A) T24 and 5637 cells were transfected with si-NC or si-Nodal-1/-2 for 24 h, the expression of EMT-TF was measured by western blot analysis; (B) J82 cells were transfected with vector control or pCMV/Nodal for 24 h, the expression of Snail was checked by western blot analysis; (C) T24 cells were transfected with si-NC, si-Nodal, vector control, or pcDNA/Snail for 24 h, the expression of E-Cadherin and Snail was checked by western blot analysis; T24 cells were treated as (C) for 24 h, the migration (D) and invasion (E) of cells were measured by wound healing assay and transwell analysis, respectively. Data are presented as means ± SD of three independent experiments. ** p<0.01 compared with control. Nodal can increase the transcription and protein stability of Snail in bladder cells. (A) T24 cells transfected with si-NC or si-Nodal were further treated with CHX (100 μg/ml) for increasing time periods, the expression of Snail was recorded (left) and quantitatively analyzed (right); (B) T24 and 5637 cells were transfected with si-NC or si-Nodal for 24 h, the mRNA of Snail was checked by qRT-PCR; (C) J82 cells were transfected with vector control or pCMV/Nodal for 24 h, the mRNA of Snail was checked by qRT-PCR; (D) After transfected with si-NC or si-Nodal-1 for 24 h, the mRNA of Snail in cytoplasm and nucleus of T24 cells was checked by qRT-PCR; (E) T24 and 5637 cells were transfected with si-NC or si-Nodal for 24 h, the luciferase activities of Snail promoter was measured. Data are presented as means ± SD of three independent experiments. *p<0.05, ** p<0.01 compared with control. 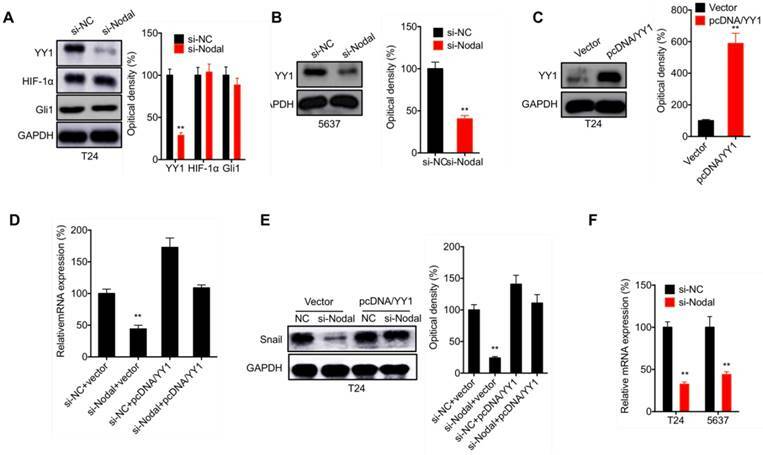 YY1 is involved in Nodal induced transcription of Snail in bladder cancer cells. (A) T24 cells were transfected with si-NC or si-Nodal for 24 h, the expression of YY1, HIF-1α and Gli1 was checked by western blot analysis; (B) 5637 cells were transfected with si-NC or si-Nodal for 24 h, the expression of YY1 was checked by western blot analysis; (C) T24 cells were transfected with vector control or pcDNA/YY1 for 24 h; (D) T24 cells were transfected with si-NC, si-Nodal, vector control, or pcDNA/YY1 for 24 h, the mRNA (D) or protein (E) expression of Snail was checked by qRT-PCR and western blot analysis, respectively; (F) Cells were transfected with si-NC or si-Nodal for 24 h, the mRNA expression of YY1 was measured by qRT-PCR. Data are presented as means ± SD of three independent experiments. ** p<0.01 compared with control. We further evaluate the mechanisms responsible for Nodal stabilized Snail in bladder cancer cells. It has been reported that ATM  and CSN2  can upregulate the stability of Snail via regulating its post-translational modifications. We found that si-Nodal can decrease the expression of ATM, but had no effect on CSN2, in both T24 and 5637 cells (Figure 6 A). In T24 cells transfected with pcDNA/ATM (Figure 6 B), the overexpression of ATM had no effect on si-Nodal suppressed transcription of Snail mRNA (Figure 6 C). However, overexpression of ATM can attenuate si-Nodal suppressed protein expression of Snail in T24 cells (Figure 6 D). Further, si-Nodal can decrease the nuclear localization of ATM in T24 cells (Figure 6 E). These results indicated that ATM is involved in Nodal induced stabilization of Snail in bladder cancer cells. The influence of Nodal on the progression of bladder cancer and the related molecular mechanisms are still poorly understood. Our present study revealed that the expression of Nodal was upregulated in bladder cancer cells and tissues. Silencing of Nodal can impair the migration, invasion and EMT of bladder cancer cells via downregulation of Snail. Mechanically, Nodal can regulate the transcription of Snail via YY1 and the protein stability of Snail via ATM. Collectively, our present study revealed that Nodal can trigger the EMT of bladder cancer cells via both transcriptionally and post-translationally upregulating Snail. As an embryonic morphogen, Nodal is a member of the TGF-β superfamily and plays critical roles in embryogenic development such as mesendoderm specification and left-right asymmetry . It presents high expression during the early development of vertebrate embryos and barely detectable in most adult tissues . Numerous studies revealed that its re-expression in cancer cells can increase the aggressiveness and tumorigenicity for various cancer types such as melanoma, glioma, and prostate cancer [16, 28]. We found that Nodal is upregulated in bladder cancer cells and tissues, while knockdown of Nodal can suppress the migration, invasion and EMT of bladder cancer cells. This was consistent with previous study that Nodal can increase the migration of prostate  and breast cancer  cells. Our present results, together with published data, suggested that inhibition of Nodal might be a potential therapy approach for overcome the metastasis of bladder cancer cells. ATM is involved in Nodal induced stabilization of Snail in bladder cancer cells. (A) T24 or 5637 cells were transfected with si-NC or si-Nodal for 24 h, the expression of ATM and CSN2 was checked by western blot analysis; (B) T24 cells were transfected with vector control or pcDNA/ATM for 24 h; T24 cells were transfected with si-NC, si-Nodal, vector control, or pcDNA/ATM for 24 h, the mRNA (C) or protein (D) expression of Snail was checked by qRT-PCR and western blot analysis, respectively. (E) T24 cells were transfected with si-NC or si-Nodal for 24 h, the expression of ATM in cytoplasm and nucleus was checked by western blot analysis. Data are presented as means ± SD of three independent experiments. ** p<0.01 compared with control. We found that Nodal can trigger the EMT of bladder cancer cells via both transcriptionally and post-translationally upregulating Snail. Consistently, Nodal can also positively regulate the expression of Snail in murine melanoma cells and then induce EMT phenotype [31, 32]. As the key factors for EMT of cancer cells, Snail can be regulated by a complex signaling network at the transcriptional and post-transcriptional levels [33, 34]. In the present study, we found that Nodal can increase the transcription of Snail via YY1, which can regulate the expression of Snail though a SOX consensus sequence and a conserved enhancer located 3' of the Snail gene . In addition, Nodal can also increase the protein stability of Snail via upregulation of ATM, which can elevate the stabilization of Snail by phosphorylation on Serine-100 . Other factors such as HSP27 , LATS2 , and GSK3β  might be also involved in Nodal regulated stability of Snail. Further studies are needed to understand the molecular cross talk between Nodal and EMT-related signal pathway. In conclusion, we found that Nodal is upregulated in bladder cancer cells and tissues and triggers the EMT of cancer cells via transcriptionally and post-translationally upregulating Snail. Although clinical verifications are needed to emphasize the roles of Nodal on cancer progression, our results suggested that targeted inhibition of Nodal might be a potential therapeutic approach to overcome the metastasis of bladder cancer. EMT, epithelial-to-mesenchymal transition; EMT -TFs, EMT transcription factors; E-Cad, E-cadherin; FN, fibronectin; Vim, vimentin; TGF-β, transforming growth factor β; YY1, Yin Yang-1; ATM, ataxia telangiectasia-mutated; CHX, cycloeximide; ELISA, enzyme-linked immunosorbent assay; HIF-1α, hypoxia inducible factor 1 alpha; Gli1, Gli family zinc finger 1; CSN2, COP9 signalosome 2. Data collecting: Wenwei Chen, Tao Jiang, Houping Mao. Writing: Wenwei Chen, Qin Chen. Data analysis: Rui Gao, Xingjian Gao, Yanfeng He, Hua Zhang. Design: Wenwei Chen, Qin Chen. Ethical approval was obtained from the Ethics Committee of the First Affiliated Hospital of Fujian Medical University and Informed consent was obtained from all individual participants included in the study. Corresponding author: Dr Qin Chen, Email: chenqin163edu.cn, Department of Urology, The First Affiliated Hospital of Fujian Medical University, 20 Chazhong Road, Fuzhou 350005, China.